This view shows part of the stellar nursery called the Tarantula Nebula in the Large Magellanic Cloud, a small neighbor of the Milky Way. At the center lies the brilliant star VFTS 102, which is the fastest rotating star yet found. Astronomers have spotted the fastest rotating star yet found — a massive and bright young star located in our neighboring dwarf galaxy, the Large Magellanic Cloud. 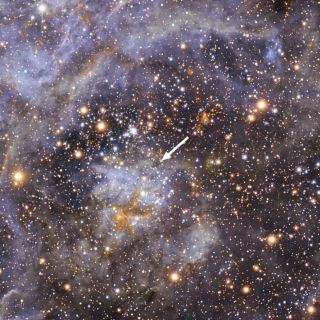 The giant star lies in the Tarantula Nebula, approximately 160,000 light-years away from Earth, and spins 100 times faster than the sun — at a dizzying pace of 1 million miles (1.6 million kilometers) per hour. The star, officially called VFTS 102, is approaching the point when it will be torn apart by centrifugal forces if it spins any faster, the researchers said. Based on their observations, the international team of astronomers thinks the star may have had a violent past and was likely ejected from a double-star system when its companion erupted in a supernova explosion. The scientists used the European Southern Observatory's Very Large Telescope at the Paranal Observatory in Chile to detect VFTS 102. They found that the giant star is about 25 times more massive than the sun, and about 100,000 times brighter. The astronomers also noticed that VFTS 102 moves through space at a significantly different speed compared to its neighbors. This speed discrepancy could mean that VFTS 102 is a so-called runaway star, one that has been ejected from a double-star system after its companion exploded as a supernova, the researchers said. According to this theory, VFTS 102 could have started its life as part of a binary star system. If the two stars were close to one another, gas streaming from the companion could have caused the star to spin faster and faster. This could explain why VFTS 102 is rotating at such an unusually fast pace, the astronomers said. After a relatively short life of 10 million years, the companion star could have run out of fuel and exploded as a supernova. The explosion would have ejected VFTS 102, which could explain why the massive star's speed is so different than that of other stars in the region. This is an artist's concept of the fastest rotating star found to date. The massive, bright young star, called VFTS 102, rotates at about 1.24 million miles (two million kilometers) per hour. Centrifugal force from this dizzying spin rate has flattened the star into an oblate shape, and spun off a disk of hot plasma, seen edge on in this view from a hypothetical planet. As it collapsed, the companion star would likely have turned into a pulsar, which is a rapidly spinning star that emits a steady ray of light over time. These cosmic oddities are created when stars collapse and become extremely dense. This theory is further bolstered because astronomers also spotted a nearby supernova remnant and a pulsar, but further observations will be needed to determine whether or not they are actually related to VFTS 102. "This is a compelling story because it explains each of the unusual features that we've seen," Dufton said. "This star is certainly showing us unexpected sides of the short but dramatic lives of the heaviest stars." To test their theory, the astronomers will use NASA's Hubble Space Telescope to make precise measurements of the star's proper motion across space, they said.